SALT LAKE CITY - If you are getting excited to take your fishing boat out for the first time this season, these five Utah lakes and reservoirs are a good place to start. These larger waterbodies will give you plenty of opportunities to troll for a variety of fish species, and you will find ample space - with little to no crowding - if you are fishing from shore. Flaming Gorge is a popular fishing area, due to its large trophy-sized lake trout and excellent kokanee salmon fishing. Several agencies are hosting a fishing tournament targeting small lake trout at the end of April, so it&apos;s a good month to visit and join in the action. Lake Powell is the second-largest lake in Utah (after the Great Salt Lake) and offers a unique fishing experience. Because it&apos;s in the southern part of the state, it gets warm sooner and spring arrives earlier, making it one of the first waters to get really hot fishing. 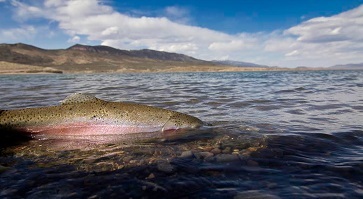 "Lake Powell has a diverse warmwater fish community, and temperatures in April and early May should hit points where the fishing is really good," said Randy Oplinger, the Utah Division of Wildlife Resources sport fisheries program coordinator. "Largemouth bass, smallmouth bass and crappie will begin spawning, and the spawn can be a great time to catch these species." Biologists recently finished surveying the reservoir&apos;s fish populations and found healthy rainbow trout that generally ranged from 2 to 4 pounds - with the largest coming in at 6 pounds. The biologists also netted some wipers that weighed up to 8 pounds, according to the latest fishing report. One angler reported that the rainbow trout are close to the shore currently and recommended fishing in the early-morning hours. Utah Lake is the third-largest waterbody in the state, but you don&apos;t need a boat or expensive gear to have success at this fishery, Oplinger said. Anglers of all ages and skill levels can be successful using a variety of techniques. The lake offers channel catfish, walleye, white bass, black bass and several different species of panfish. Along with fishing, it is a great place for power boating, sailing, canoeing or kayaking and also provides camping and day-use facilities. "Bear Lake is unique because it&apos;s the only body of water in the world that has Bear Lake whitefish, Bonneville whitefish, Bonneville cisco and Bear Lake sculpin," Oplinger said. "The two whitefish species are caught readily by anglers. The cisco is mainly caught by anglers using nets when it spawns in late January through early February, and the sculpin isn&apos;t caught very frequently by anglers, but is an important prey fish that feeds other fish in the lake."